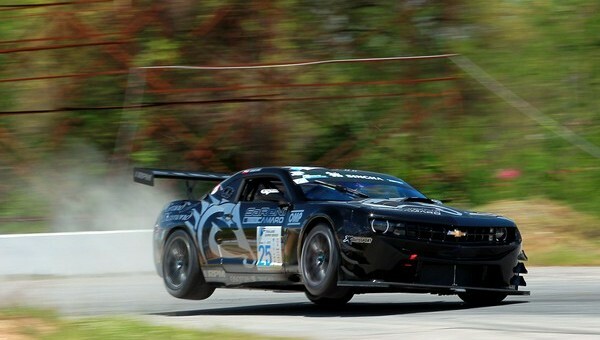 German racing team Reiter Engineering and their young Camaro-focused division Sareni Camaro have developed a Chevrolet Camaro GT3 race car, available for the low price of 195,000 Euros. The Katech V8 in this GT3 race car has a colossal 7.9 liter displacement. Power is quoted at north of 650 HP, with help from an Euro-8 engine management system and MoTec Power Distribution Module. Lubrication comes from a performance dry sump oiling system, and the gearbox is controlled by way of a 2012 Holinger speed-shift unit with paddle-shifters. Beside all this, the GT3 Camaro wears some very serious aerodynamic business attire. The rear wing is massive, which should help to balance out the still less-than-ideal 55-45% front-rear weight split (despite the engine being 74mm further back than in the production car). But the front end is ready to make downforce as well, with an adjustable splitter the size of Spain and three additional stacked slats on either side. By Jove, we think they’ve nearly done it.